Jerry Harper, a retired Lawrence lawyer, told Rotarians about Dr. J.R. Brinkley, the notorious goat-gland doctor from Kansas. In 1917, Brinkley arrived in Milford, KS, to establish a practice. 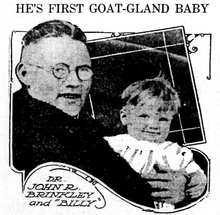 When a local farmer convinced him to transplant goat glands into him to renew his “vim and pep,” the patient and his wife had a baby the following year. News of Brinkley’s success spread rapidly, and soon he was charging $750 per operation, doing 50 procedures each week. Although his dubious surgery became a lucrative business, Brinkley was probably more remarkable as a marketer. In 1923, he started the “Sunshine Station in the Heart of the Nation,” a radio broadcast that ran a full schedule of weather, stock market updates, music, even French lessons and college courses. This innovative use of radio broadcasting also promoted good health, recommending his surgical procedure and his medical advice and referring people to his network of pharmacies to supply the remedies. When Brinkley began to answer medical questions on the air, however, his medical license was revoked. But his notoriety made it possible for him to run as a write-in candidate for governor of Kansas in 1930, garnering 30% of the vote. After the race, Brinkley moved to Texas and continued to broadcast his messages nationwide. He lost his fortune in the following years and died with nothing in 1942. Jerry Harper is a fan of colorful characters from Kansas. In addition to his law practice, he served in the Kansas House of Representatives, taught as an adjunct instructor at the KU Law School and in the KU Humanities Program.